The Blue Widow was introduced upon the request of bow hunters who had wondered at first glance what they would do with the rifle scabbard on our Dragonfly and Just One packs. Most of those who used the J107 found that they like the scabbard after all, because it’s a great place to put things like arrows and grunt tubes. We like packs so much that we decided to honor the idea and apply some of the un-tapped items in our design locker. The Blue Widow is basically a Dragonfly with the scabbard layer removed. The main vertical pockets and utility expansion compartment are attached directly to the main frame panel. We added a larger Flex Chassis which can fold forward for use as a seat. And because we think that scabbards and packs go together, we made it so that you can add one if you need it. 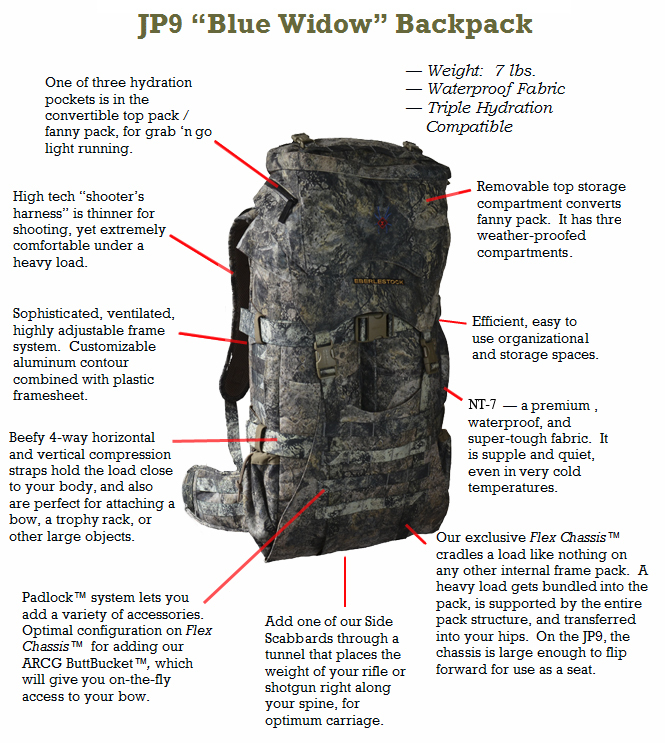 Similar to the Just One and Dragonfly packs, the JP9 has a wide range of configurations. The basic pack capacity runs from about 2200 cubic inches (including the removable fanny pack) to about 4700 cubic inches. 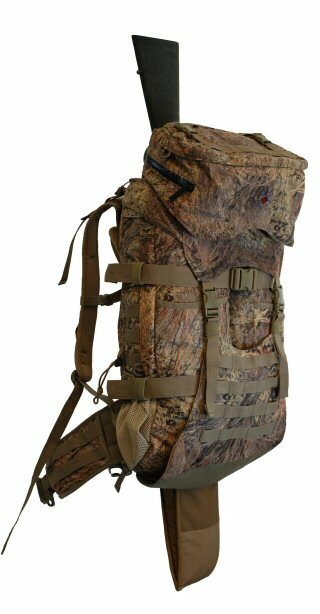 Add a Spike Camp Duffel to the outside and it grows to 7200 cubic inches; add a Super Spike Duffel and it grows to 7600 cubic inches. The pack's patented Cam Expansion feature and unique features such as the 4-way compression straps and Flex Chassis give it outstanding performance in every configuration -- so you can use it as a compact, close riding daypack, or as a full-scale freighter, or anything in between. Most packs will only do one of these things, and the Blue Widow is designed to outclass them all, whether daypack or freighter. We've been hearing from customers who really like the fanny packs that are made of the JP9 and J107 top compartments. These fannys beat your basic fanny because they ride extremely well, and they have a hydration sleeve built in -- so you can put your water and essentials in the top pack, and then pop it off to do a lightweight recce run. The Blue Widow's fanny features compression straps, and Padlock webbing style attachment system, so that when it's woven onto the main pack it'll ride like it's sewn to it. Add our ARCG ButtBucket kit to the Blue Widow to get what is undoubtedly the best full-format bowhunting pack on the market. You can mount the ButtBucket high or low, depending on what works best for your rig. If you mount it high as shown here, you can sit and ride a horse while wearing the pack and carrying your bow. The Blue Widow has a unique portal built into the frame's back wall that's designed to accommodate one of our Side Scabbards. Choose the A1SS (for shotguns), A2SS or A2LS (for scoped hunting rifles and bolt-action sniper rifles). This configuration puts the scabbard right along your spine, which is the perfect place to carry a heavy long item like a long gun. And, as you'd expect, you can easily retrieve your rifle from the pack when using this system. The frame on the Blue Widow is simple, sophisticated, and extremely comfortable. The main pad section rides directly on the contourable stays, and is vertically adjustable to exactly fit the torso length of the wearer. The pads have just the right amount of body contact, and an air space between these and the framesheet allows a great deal of ventilation, giving the pack the best advantages of both internal and external frame packs. 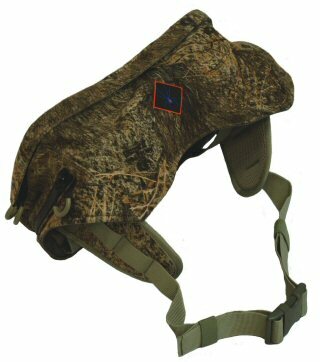 Choose Hide-Open Western Slope, Hide-Open Rock Veil, or Mossy Oak Brush NT7 Waterproof Microfleece/ Dry Earth or UNICAM 1000 denier nylon.